Tom is back putting players head-to-head in Versus. Today he focuses on defenders for the second time. Zach Tuohy already looks to be one of the best pick ups from the most recent trade period. In his two JLT games, the Irishman scored 107 and 97 and looked at home on both occasions. A dashing defender who possesses a booming kick, Zach never managed an average of over 75 Fantasy points during his seven years at Carlton and last season put up just two tons. So why do we all seem to think he’ll light it up in 2017? Well, as mentioned above, he has already made a promising start. Along with this strong JLT form, Tuohy is shaping up to play a quarterback-type role for Geelong, which generally translates into an increase in Fantasy points. It’s amazing how teams like Geelong and Hawthorn seem to get the best out of second-hand players. I can see the same thing happening with Tuohy and predict an overall season average of around 85. If this is the case, he is bargain material at $442,000, further enhancing his appeal. Against Adelaide on Sunday afternoon, Tuohy’s pin-point foot skills cut through the Crows lines on numerous occasions, however the Cats are not short on options in the back half. Tom Lonergan would have to be one of the first picked in defence for the men in blue and white whilst Harry Taylor and Lachie Henderson likely rotate with each other in attack. Both have proven to be very capable at either end. Then, I would say Jake Kolodjashnij is picked as the third tall leaving another three on-field spots in the backline. Although he is not a lock for the best 22 this year, like he has been for the last decade, Andrew Mackie is still a decent defender whose experience will be called upon given the retirement of Corey Enright. Draftee Tom Stewart has shown enough to warrant selection come round one. Although he has an attacking side to his game, I think he’ll play a lock-down defensive role on opposition small forwards. This leaves Thurlow and Tuohy to provide the rebounding. The former is coming back from a season ending knee injury and is a weapon but Tuohy is the primary choice when looking to transition into the forward line. He is the main man and should be on everyone’s radar. What a superstar this guy will become in the next few years. Callum Mills couldn’t have done much more in his debut season at the Swans. The Sydney academy prospect was judged the best midfielder in the 2015 draft pool when the Demons placed a bid on him at selection three. Despite playing the majority of his draft year in the midfield for NSW/ACT and North Shore, he was deployed across the half-back line in 2016. Mills’ decision making, one-on-one ability, reading of the play, intercept marking, calmness and courage makes him an obvious choice for a role in the back half. At various stages across the season, Callum also held his own when asked to play lock-down roles on the likes of Jake Stringer, Jack Gunston and Chad Wingard. A transition into the centre was always going to be on the cards, however, the departure of Tom Mitchell and recent illness to Isaac Heeney will likely see this move fast tracked. 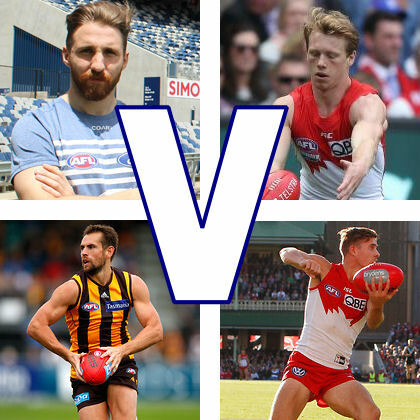 We already know that Parker, Hannebery and Kennedy form the foundations of arguably the best midfield group in the competition. They will obviously start in the guts. Jake Lloyd is expected to feature on the wing and Zac Jones may be given a crack on-ball.Shaun Edwards may also get a run. I can see Kieren Jack playing more forward of the ball to allow for the younger players to prove themselves in the midfield. This probably leaves one more spot and that surely belongs to Mills. Once Heeney recovers from his glandular fever, we could see Millsy return to half-back on a part-time basis but rest assure he will feature prominently in the centre this year. That may or may not prove to be a good thing but it normally points toward better numbers. At the conclusion of the third week of the JLT series, Mills is the sixth highest scoring player, having produced 110 and 84 against North Melbourne and GWS respectively. Both of these scores came from 78% time on ground and Mills spent time in both the midfield and backline. Natural improvement, an improved role and good JLT form should see his average move into the high 80’s. No chance of second year blues here. An excellent D3/4. Verdict: Without a doubt, Mills v Tuohy is the most hotly talked about comparison in the Fantasy world at the moment. It has been brought about by very strong JLT form and the likeliness of a Fantasy friendly role. It really is a tight one and I think both players will pump out averages close to 90. But would you have considered Zach before the pre-season games commenced? The illness to Heeney has tipped me in the favour of Mills here. His hard edge, courage, leadership and versatility have made Luke Hodge one of the best footballers to ever play the game. Whether he’s extracting the ball from congested spaces, ordering the troops from the back-line or pinch-hitting up forward, Hodgey gives 110%. And he’s been a strong Fantasy prospect since debuting back in 2014. Although he has only managed a 100 point season average three times (2005, 2010 and 2015), the former skipper and one-club player has dropped below 70 just twice. 2016 was an interrupted year with injuries preventing him from playing in nine matches. But Luke showed he still had it in him with scores of 111, 118 and 113. Yes, he isn’t getting an younger, and yes he will be rested throughout the year but there’s no reason why he can’t replicate a high 80’s, low 90’s average again. The departures of Lewis and Mitchell will only further benefit Hodge as they were taking plenty of touches away. Even though Titch and JOM have arrived, I think we’ll see Hodge pick up even more of the ball. Whether he plays in defence or the midfield, he’s proven over many years to be able to score heavily anywhere. Role is not an issue and neither is Job Security. Many coaches will almost automatically rule a line through premiums over the age of 30 with age and durability reason for concern. This year we have been blessed with an array of attractive premium defenders. And for many, players like Hodge don’t fit into their strategy. However Hodge certainly has the runs on the board, is in an arguably improved role and comes at a price which is perhaps a few points below what he is capable of. Consider at the very least. Jake Lloyd is another who looks destined to benefit from added midfield time. His 2016 was somewhat of a breakout year as he averaged 84 Fantasy points from 21 games. It started very well, with an equal career-high 35 disposals and 110 points in the big win over Collingwood. His good foot skills and strong endurance were on show against Carlton but only lead to 72 points. Lloyd wasn’t particularly brilliant throughout the middle stages of the year. The occasional 90 was followed by scores typical of what we’d seen from Lloyd in previous years. But in the last month of the season, Lloyd scored 107, 119, 88 and 131 to really lift his season average. These are the sort of scores Fantasy coaches will be hoping he brings to the table on a more consistent basis this year. Lloyd has spent the first four years in a number of roles. He was originally drafted as a midfielder but spent time in the forward line in 2014. Lloyd spent last year playing off half back and on the wing. He was a prolific ball winner who provided rebound and drive. But this year he expected to play even more time as an outside midfielder, likely increasing his Fantasy score. I won’t go into how I think the Swans midfield will look like as that has already been done above but he looks to have made the wing his own. At $521,000, Lloyd fits somewhere in the middle between mid-pricers Mills and Tuohy and popular premium’s such as Laird, Docherty and Adams. At this price, some coaches may be able to fit him in at D3 and either Mills or Tuohy at D4 – creating a very good defence. Another reason why Lloyd should be on your radar is that he offers a point of difference at a current ownership rate of 4.85%. Your going to need a few POD’s if your ever going to win this thing. His job security in the Sydney outfit is unquestionable and he should continue to improve, lifting his average closer to 95. Verdict: You’ve got to have a few POD’s to win this. That’s what many of the more experienced Fantasy coaches will tell you and it’s true. The back line isn’t my preferred area to chuck a player of difference in and, admittedly, Mills and Tuohy are firming as better options but Hodge and Lloyd demand to be looked at. Personally, I’d go for the youth of Jake Lloyd. Great article! I like how you compared 2 PODs. I’ve currently got both Mills and Tuohy in my backline as I agree with you that both should avg. 85-90. Thanks Kenjo! I am starting to really like the look of Tuohy and Mills in the same backline. It’s definitely the year of the midpricers! Keep up the good work! I’ve got Tuohy, but really want to squeeze Mills in! I agree with Kenjo – great article thanks Tom & comparing PODs, although they’re both becoming more popular by the day. I had Tuohy on my radar even pre-JLT as I thought he’d pick up a lot of cheap +6s like the retired Enright used to. I’m running with Mills in Fantasy & Tuohy in RDT both at D4, partly because of different bye structure in those teams for me. Cheers Burger! It wouldn’t entirely surprise me if Tuohy takes his average beyond 90 with the departure of Enright. Only criticism I have of him is his lack of real Fantasy ability in past seasons. Up until last night I had Thuoy and Mills, got talked out of it when I put my team up online. I then downgraded Thuoy to Stewart ehich gave me enough cash to go SPP to Dangers, meaning my structure changed with the Def relying on 3 rookies stewart Hampton and whoever EVW etc but means my mids have JOM at M7 & Barrett at M8 nice luxury. This is the exact structure I am going with at the moment. I like the strong midfield and balance in other lines. Is Heeney playing round 1 anymore? It really depends, I had glandular fever + tonsillitis and I was able to travel interstate and resume full gym work in 3 weeks (I’m the same age as heeney and in decent shape) i’d probably say a month at most for him, but there are so many other factors that can contribute. If he comes back too early it’ll cook him even more, my guess would be a round 2 comeback and limited minutes, or round 3 as normal. Thanks for that, who’s everyone replacing him with? Tuohy has a great bye round, opportunity to move into the Enright role, never had the opportunity to move into a rebounding half backman at Carlton with the likes of Docherty, Simpson and even Gibbs and it doesn’t look like he’ll have the lock down roles he was task with at Carlton. If you hadn’t thought he would at least improve prior to the JLT is an oversight by many. I know this isn’t related but I haven’t seen a draft related chat. I managed to get Nankervis as a f5 with grundy and hickey in the rucks. Worth trading him for a better forward or holding him as a backup ruck if need be? Would you pick Lloyd over Tuohy? same price point, same average? Houli would be a POD as everyone goes Laird. Houli was interrupted with injury last year, just worried if caddy or prestia may affect Houlis run and occasional playing on the wing? Thoughts? couldn’t agree more Jake. I had Houli as a POD last year and he would score 140 one week then 60 the next. I had them both and my team felt good, stick with it. Thinking upgrading Tuohy to Lloyd/Hodge but think the’res value in Tuohy to squeexe out first.. Or I could go from STeele to Touk Miller……. Or upgrade Bont & Fyfe to Titch & J.Steven? Similar roles however Bob avg 102 before being injured last year in a young side, and with coming of age players running around i feel his ceiling may have decreased. Touhy however is full of potential in the Geelong defense with bartel and others out, and I feel he could be a Johanissen/Docherty type player for Cats (aka slingshot)? add hartlett to the list and I will still pick tuohy just over mills. Never mind these selections guys, go for hamish harlett $474,000 averages over 90 and is cheaper save that cash for someone later on in the season.